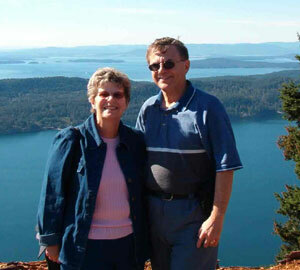 Click here to view larger image of Joe and his wife in British Columbia, Canada in 2004. Read the CIC document which deals with Children Born out of Wedlock. Joe Taylor is the child of a Canadian War Bride and a Canadian Servicemen. He has been told he is not a Canadian citizen. I would like to point out what I believe to be an error in the information which CIC supplied for you to put on your new webpage (which is brilliant!). The narrative then says children in this category were admitted to Canada as permanent residents and did not automatically become citizens. Unfortunately this may be what CIC would prefer the situation to be but it does not conform to the laws in force before January 1st 1947. Most war bride children would have become Canadian Nationals both under the 1921 Canadian Nationals Act and the Order in Privy Council 7318 of September 1944. The latter stated that upon landing in Canada these dependents were to be deemed to be non-immigrant and to acquire the status of the father. Every dependent applying for admission to Canada shall be permitted to enter Canada and upon such admission be deemed to have landed within the meaning of the said Act; and where the member of the Canadian Armed Forces is either a Canadian citizen or has Canadian domicile, the dependent shall, upon being landed, be deemed to have acquired the same status for the purpose of the said Act. Excerpt from PC OC 7318, September, 1944. "Notwithstanding the repeal of the Naturalization Act and the Canadian Nationals Act, this Act is not to be construed or interpreted as depriving any person who is a Canadian National, a British subject or an alien as defined in the said Acts or in any other law in force in Canada of the national status he possesses at the time of the coming into force of this Act." Taken from s.(46)(I) of the 1947 Repeal of Canadian Nationals Act inside the Canadian Citizenship Act. I hope this clarifies the situation but if you need any further information please contact me.